That's not all that much though, and while I like the clean look of an "under-stocked" tank, I also admit that there is some more room that could be filled in. 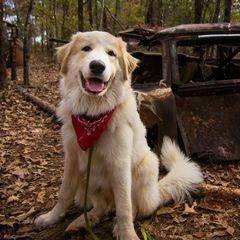 What do you guys think about additional livestock? Perhaps another gorgonian to take up some more vertical space? Maybe another colony of zoas, or some ornamental macroalgae? I am very undecided at this point and welcome any suggestions. What does a Caribbean biotope need to have before it can be called "complete?" Hmm... looks like it could be a D. neglecta, but it could also be something else. Yours seems to have a similar warty surface and shows some evidence of elongated peripheral tentacles, which are D. neglecta's most distinguishing characteristic. They might not be quite elongated enough, though; I seem to remember that mine had very distinctive tentacles even when it was small. Here's a macro shot of mine from today for comparison. What do you think? Though now that I look at them side by side, it does look pretty similar! Did you order yours from an online retailer, or did you get it locally? 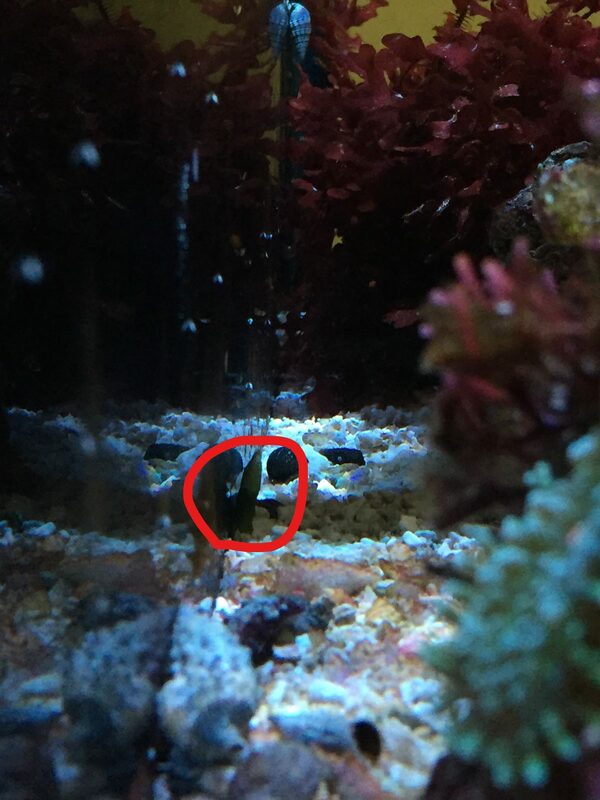 Regarding your mystery masked goby death. It could be aggression issues between them. I looked into masked gobies before and some said schooling isn't possible due to the aggression they have between one another. I was thinking about that today, as I had noticed my masked gobies demonstrating quite a lot of aggression towards one another. A word of caution to anyone considering getting some of these fish for their nano: they may school in a larger tank, but in a small aquarium they appear to just go after each other all the time! Lesson learned! Hopefully they will start to get along a bit better now that there are only two of them left... I should have opted for a wider variety of fish from the get-go, though. A more diverse population is almost always better. The anticipation! 😄 Did you end up going for the PolypLab lens set? That's the one I decided to get and it has been working out pretty well for me so far. Diversity is what makes the Caribbean interesting! Trust me I think I always had kpaquatics as a tab on my computer as I looked for compatible and interesting Caribbean fish. Constantly googling and researching each one! I just bought a generic lens from China that's why it's taking so long. I know exactly what you mean... I am browsing kp's website on the daily trying to come up with good final stocking plans! 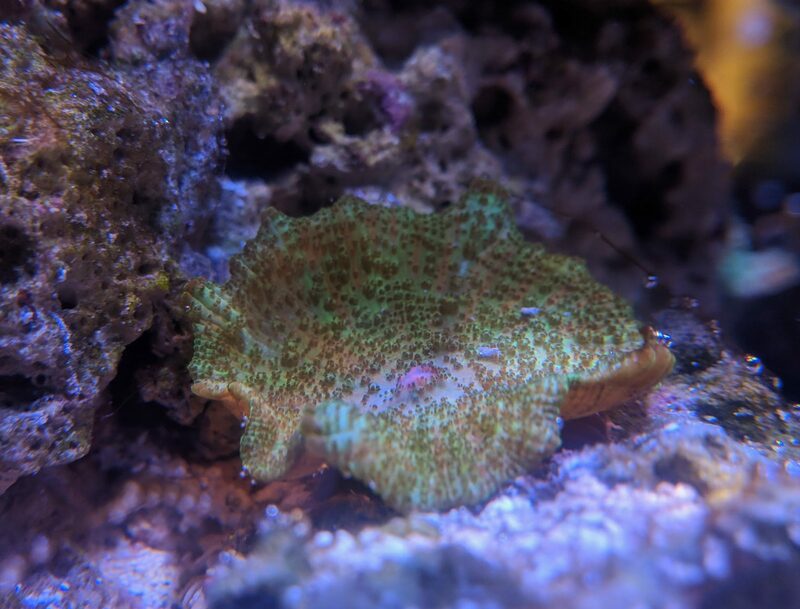 Having a massive Discosoma neglecta in my tank is sort of complicating things though, as I would like to get a blenny of some kind but am not sure that I should be purchasing any more perching fish - especially since my mushroom has already demonstrated that it has a taste for flesh! Maybe if I got a fish that is a bit bigger it would be able to avoid the Maw? I'm really not sure. D. neglecta seems to be quite uncommon in the aquarium trade and I have not read much about what fish can be kept with them. This pretty branching red alga was run over by a limpet last night, so I had to pull it out this morning. A little nub of its holdfast is still attached to the rock, so it will probably grow back again. 😄 Not sure about the species, but I think it might actually be some sort of "pest" alga; I've read about a so-called "red Dictyota" here and there, and this species certainly fits that description. This pretty branching red alga was run over by a limpet last night, so I had to pull it out this morning. Little hard-shelled beaver you've got there! What if instead of a fish, you do a cool centerpiece invert? Are there are Caribbean dwarf lobsters? Limpets are definitely little bulldozers! Very effective grazers, but somewhat destructive. Not a bad idea! I will have to check into that and see what sort of options are available. My dream is to have a wide lagoon-style tank with a lot of sand that features upside-down jellyfish (Cassiopeia sp. ), but that is definitely not going to happen with this system 😄 Especially since I am fairly sure they require regular feedings with live rotifers, Artemia, etc. Here's an interesting discovery I made the other day! For awhile this "pebble" had been sitting on the substrate inside a cave in my rock structure. I thought nothing of it for a long time of course, since it was just a rock... but then I noticed that it seemed to be scooting towards the cave entrance little by little. Each day it moved just a bit. 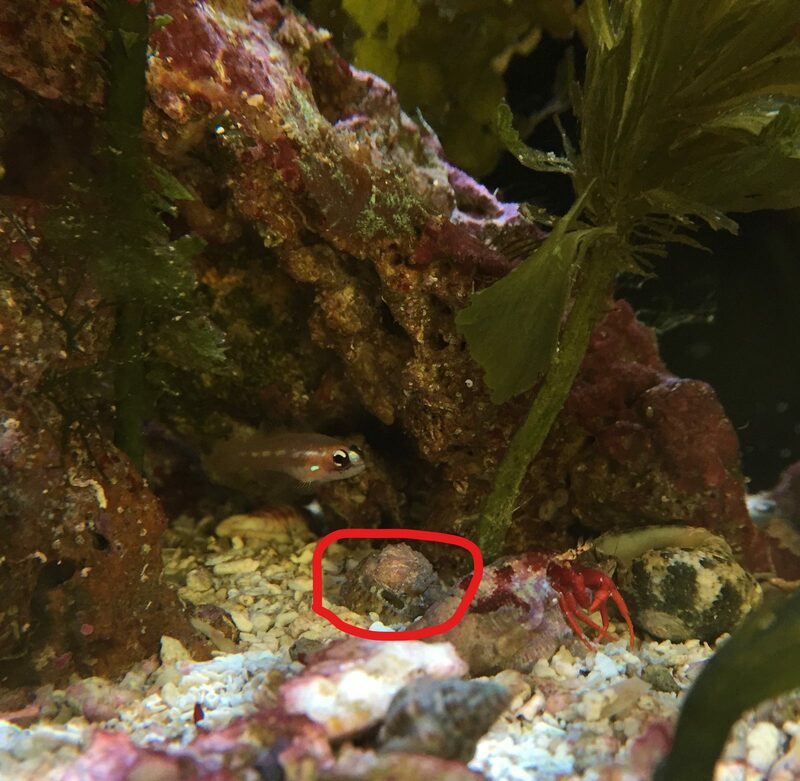 I figured it was being pushed around by snails or other nocturnal sediment movers, but yesterday I was observing my tank and noticed that this little pebble had a pair of siphons! Turns out it's some kind of bivalve! I'm not sure what it is or what it has been eating, but if it came in on my live rock it has certainly been in there for a long time. This is encouraging, as it suggests that other filter-feeding organisms that I'd like to add in the future (namely a ball sponge and a feather-duster worm) might have a fairly good chance of staying alive. Not a bad idea! I will have to check into that and see what sort of options are available﻿. I was just thinking something like that would last a bit longer being neighbors with your neglecta. Since it appears that small perching fish aren't a long-lived option. Here's an interesting discovery I made the other day! I can't quite tell from the photo, but is it a chiton of some kind? I agree; in fact I have a feeling that fish in general aren't going to be a big part of the future of this tank. This is admittedly a little weird, since the Caribbean is home to such a diverse variety of beautiful fish, but inverts (and even stranger, algae) have always fascinated me. Removing the Maw (as I have begun to refer to my D. neglecta) is of course also an option, but honestly I love how huge and beautiful it is. It's really a gorgeous mushroom, and I have no desire to take it out of my tank. It appears to be some sort of clam, or perhaps a young oyster. The dark spot on the front of it in the picture above is its open siphon, and a smaller second siphon can be seen (though not too well in that picture) right to that spot's left. I have been experimenting with some different camera angles to reduce glare in full-tank shots. I rather like this angle, as it lets you see the ricordea on the left side of the tank reflected in the glass! Here you can see a pinecone alga (Rhipocephalus sp. - right in the center) that appears to have sent up a shoot smack in the middle of a cave, which is literally the darkest place in my tank, and is now growing directly into the pink Galaxaura above it. So that's pretty weird, but whatever! I just let them do their thing. Here's another nubbly sprout coming up in the very back of my tank. Not sure what this one is yet; it could be another pinecone, or possibly a sea fan (Udotea sp.). And finally here's a shot of the left side, which is my favorite view of the tank. As you can see, red slime on the substrate continues to be a problem, but I am hoping that the introduction of a refugium plus a few additional macroalgae in the main display next week (I have some Halimeda on order) will help hold back the cyanobacterial scourge. This Discosoma carlgreni is showing impressive expansion after a 15% water change today. I am not sure how big these mushrooms get before splitting, but this one has grown to a fairly impressive size. So I had two more peppermint shrimp arrive yesterday, and so far they are looking pretty good. They acclimated well, spent the whole night running in circles around my tank, and are now hanging out, doing normal shrimp things. No signs of the weird mania that caused my previous shrimp to seizure and die. My two scarlet hermits and single porcelain crab are also all alive and well, so it would appear that my crustacean keeping problem is over for the time being. Here's hoping it stays that way! I know peppermints are pretty much the most basic shrimp you can have in your system, but I still find them to be very graceful and beautiful. They look like they are at home among the pink and red coralline algae on my rocks. I sure hope they continue to do well! Well after wandering around my tank for a few days my porcelain crab seems to have found a favorable position, and sure enough he now rarely moves. The underside of this rock arch seems to be a popular spot for filter feeders, with a large red tunicate, the brown encrusting sponge behind it, and whatever that white filter-feeding thing under the tunicate is (another sponge maybe?) all doing well in addition to the crab. That makes me think that this vicinity might be a good spot for my red ball sponge, whenever I finally get around to ordering one. I also should have my refugium set up by mid-week; I cut an acrylic top for my back chambers (I used the drillable top provided with the C-Vue glass lid set, which I bought for some reason but absolutely despise - if you are reading this and want a lid for your C-Vue, just make a screen one please!) and have my InTank fuge box all ready to go. Just waiting on my submersible light and of course the Chaetomorpha, both of which should arrive by Wednesday. Big changes are afoot for my little tank! Hopefully the combination of superior flow from the MP10 + nutrient uptake from the 'fuge will help me put nuisance algae in its place once and for all. The red slime cyanobacteria on my substrate does not seem to be harming any of my livestock, but it is nonetheless extremely unsightly. Glad to hear they're doing well! I've been having really mixed feelings about mine. They are beautiful and graceful like you say. Mine's very active, always out and about. Unfortunately, it's making feeding the corals and training the new Rainsford goby onto frozen foods very difficult. I like your tank, it looks so realistic. Just like something you would see in the ocean. Peppermints definitely seem to have a checkered reputation in the reefing community. 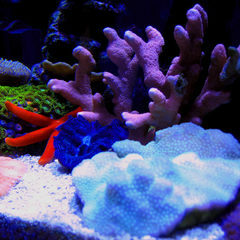 Some people report that they are totally docile and only scavenge and eat Aiptasia, while others say that they are aggressive bastards that rip open the tissues of corals to get at the food inside. Mine so far have been gentle, but they are still adjusting... I'll keep an eye on them to make sure they don't get up to no good. I'll bet that anything that eats Aiptasia is likely to sample pretty much any invert with tentacles (one reefer whose tag I can't recall even reported that a peppermint killed his hammer coral), so I will be sure to check my Ricordea for signs of harassment.